Every reader at Bookmans has a favorite genre, although most of us read books from multiple genres. Why choose one when you can have them all? And books about books–any book nerd understands the appeal of reading a book about books! These works express our overwhelming love for books and for reading. If this describes you, try one of these four books (fiction and nonfiction) about books (fiction and nonfiction). 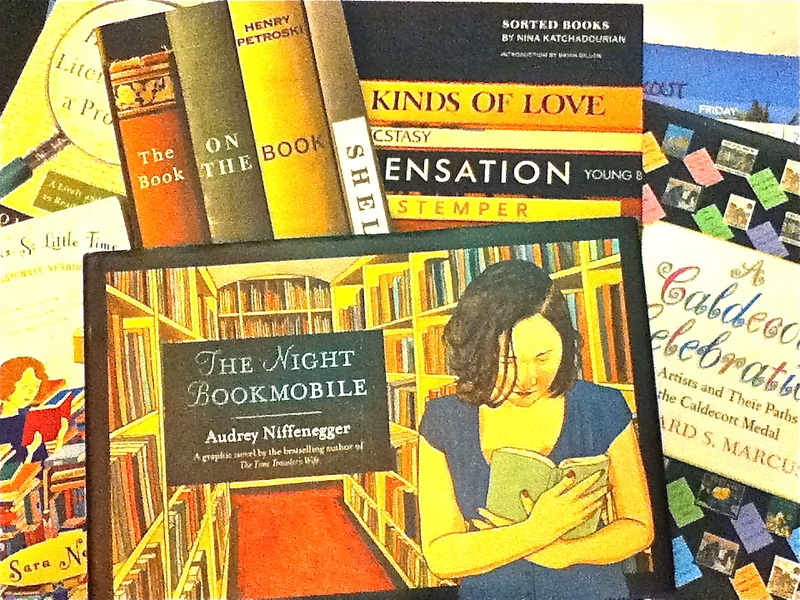 The Night Bookmobile by Audrey Niffenegger comes in the graphic novel format, a trend we whole-heartedly support. Why let the kids have all the pictures? Niffenegger combines all the things we love–books, books about books, and art. In this novel our main character, Lexi, discovers a mysterious night bookmobile that appears out of nowhere and has an extensive library, however, it only includes books Lexi has already read. For many life-long readers, literature impacts our lives immeasurably. Our literary histories are inextricably interwoven with our personal histories and development. In the bookmobile, Lexi has a physical embodiment of that impact. As a side benefit of reading The Night Bookmobile, the book supplies readers with wonderful book recommends. A Caldedcott Celebration by Leonard S. Marcus celebrates the 60th anniversary of the Caldecott Medals. Caldecott Medals are awarded each year to outstanding children’s books. This book focuses not just on the books themselves, but also on their illustrations. Learn more about the histories of the winners with a look into the making of these illustrations as well as the illustrators motivations and inspirations. (Aside: Many Bookmans employees collect children’s books specifically for the illustrations.) These children’s books are a humble reminder of the power and wonder of art. They are treasures to be enjoyed for a lifetime and showcase top artists’ works. Sorted Books by Nina Katchadourian is a visual love letter to books. It is a small coffee table book featuring photos of shelved books. Each chapter includes history and contextual background on the featured works. Readers are also treated to a close look at vintage and rare texts that are not typically available for perusal. So Many Books, So Little Time by Sara Nelson is a book close to our hearts. It is for anyone who dreams of taking a reading vacation. The subtitle is “A Year of Passionate Reading” and few among us wouldn’t want that experience. Many Bookmans employees have stacks of books we plan to read–eventually. At any given time, most of us have more that one work in progress. Nelson is a self described “readaholic” who embarks on an ambitious project to read 52 books in 52 weeks. What she learns amazes book lovers and makes them smile with recognition. We have so many more books about books that we’d love to share. We are Geeking Out this month at Bookmans. If you’ve been following us here or on Facebook, Twitter or Instagram, you’ve likely seen posts about cosplay and video games and fandoms. We are all in for interests of all kinds, but our first love is reading. Be careful when asking for a book recommendation here at Bookmans. Plan to spend a minute (or 60) because we can talk books and will always take the opportunity to do so. * Bookmans is your store to explore. If you would like to pick up a copy of a book mentioned in this post, or any specific title, give us a call and we’ll check our shelves for you. Otherwise, we hope you’ll spend time with us browsing our shelves. 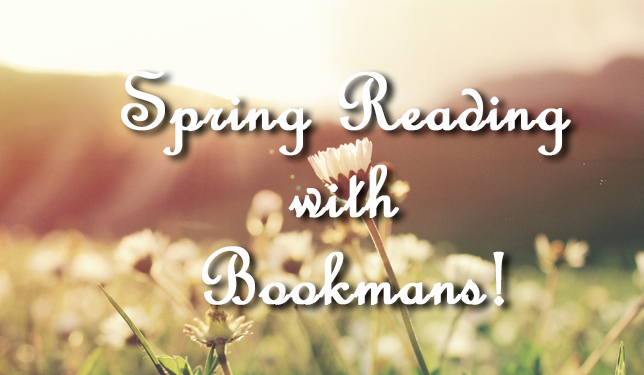 Spring Reads I’m Here for in 2019!